Are your rat's nails needing a trim? Here are some tips. Not all rat's nails need to be trimmed, and there is seldom a medical need to do so. Most of the time they are trimmed because humans are being scratched. 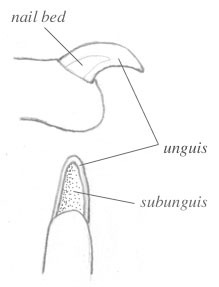 Similar to other animals, the nails have a blood supply -- in this drawing it's labeled the nail bed. It can also be called the quick. Care must be taken not to cut too far back. So to start, get yourself some sharp human fingernail clippers. If they've been passed down generation to generation, they're probably not sharp any more and will tend to crush rather than cut the nail. Get yourself some tissue for the inevitable poo. Keep some styptic powder nearby just in case or you can use flour or cornstarch in a pinch. Find it first, though, before you need it. Now select your first contestant and place your rat on your lap. Clippers go in your primary hand and your secondary hand both holds out a foot pinched in fingers and gently presses the rat against you. Alternately, recruit a friend! You're really only looking to take a very small amount off the end to stop the sharp on your skin. Once you're practiced you can try taking a bit more off, but you're not really benefiting because the new growth will still be sharp, just further down the nail. A couple tips? Try doing one foot, stop, then treat. Wait a bit then do another foot. Eyesight fading? Get a headlight and position it to aim light at the rat foot. Positioning a finger behind the elbow helps keep the rat from pulling their foot away. Eventually many rats grow to tolerate this, though they don't particularly like it. I've never personally had any luck with placing rocks in the cage to file them down, the rats just use them to pee on. Lava ledges are fantastic for the rats to chew but I've not noticed mine standing on them long enough to affect their nails. My rats loved their Wodent Wheel, then when I installed the track that is supposed to sand down their nails, they no longer went in. Perhaps it didn't feel good to walk on anymore.